This is equal to difference between liquid limit and plastic limit of soil. Plasticity index is also denoted by PI. This is the range of the water content within which soil achieves its plastic state. This is a measure of plasticity of soil of our interest. This parameter cannot be negative if plastic limit, in some exceptions, is larger than liquid limit, ignoring negative value, it is considered to be zero. Plasticity index is a measure of degree of plasticity of soil which indicates qualities of binding particles exist in clay soil. This parameter cannot be negative if plastic limit, in some exceptions, is larger than liquid limit, ignoring negative value, it is considered zero. 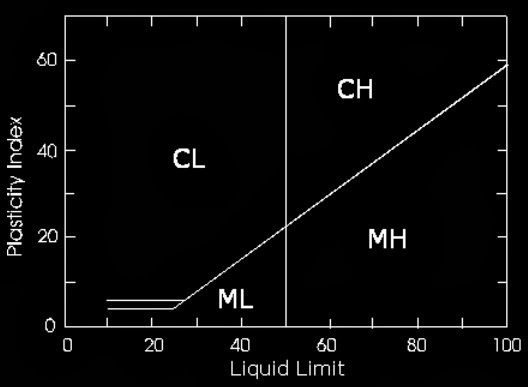 In case of coarse grained soil liquid limit coincide with plastic limit and can be said that they cannot reach plastic state, that is Ip=0. A soil is considered non-plastic when liquid limit or plastic limit cannot be determined and denoted by NP. Inorganic clays from non-volcanic origin usually have liquid limit less than 100 at best equals 100. But when clays contains significant amount of organic matter liquid limit may often found to be greater than 100; same trend is also found for from volcanic origin. Bentonite; a clay consisting chiefly of volcanic ash disintegrated by chemical process, possess liquid limit range of 400~600. About 70% particles of bentonite is of colloidal size (look like scale or sheet) which is about 30 percent in common highly plastic clays. same types of particles also found in mica and kaoline ( entirely or partially) but of relatively coarser size as compared with highly colloidal particles exist in plastic clays. Thus latter two definitely possess lower plasticity than ordinary clays. Organic clays usually possess liquid limits more than 50 and the plastic limits of these soils are also equally higher.So organic soils have low plasticity index even though they possess relatively high liquid limits. When we are discussing about plasticity index the focus will be the clay soils. It is known to all that natural structure of these soils has significant influence on their engineering behavior. Among all consistency limits and indices, only shrinkage limit can be obtained from both disturbed or remolded and undisturbed soil. Except this, other tests for consistency limit are conducted on entirely remolded soils. • Stress history, i.e. whether normally consolidated or overconsolidated, of soil deposit. 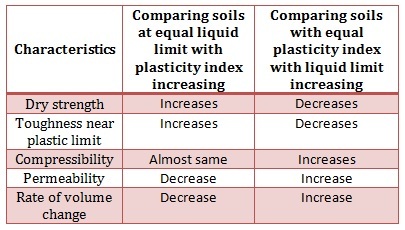 As plasticity index is a product of these limits, consistency limits together with other indices including plasticity index, can be used to classify fine-grained soils to be used for engineering construction. It should keep in mind that a rough information about characteristics of soil can be obtained by these parameters. • Plasticity index of soil depends chiefly on clay content in soil. So Soils that have high plasticity index are considered to tend to clay. For a particular soil, plasticity index increases proportionally with the percentage of clay particles. When Ip and clay percentages of a group of soil is plotted, a straight line is obtained connecting origin. • With the decrease in particle size, a rapid increase in plasticity index is observed. Thus plasticity index is a measure of fineness of particles. If clay percentage of soil is changed artificially a relationship between plasticity index and clay percentage can be established. Different straight line will be produced for different soils, as it is considered that two soils have same percentage of clay, they will have different constituent minerals. 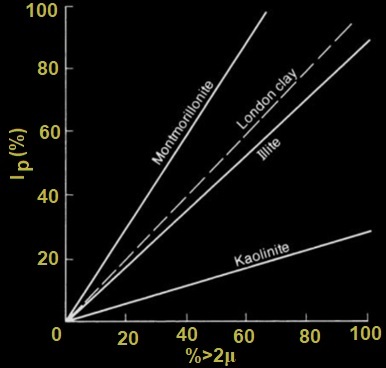 The relationship between fineness of kaolinite, illite, montmorillonite and plasticity index are presented above. Skempton (1953) termed this ratio as activity of that clay. The soil that have high activities are known as active clays which exhibits plastic behavior over a broad range of water content i.e. greater expansion when water content increases and large shrinkage when dried. According to Skempton, volume change in soil under swelling and shrinkage is a function of clay fraction in the soil and plasticity index. • Plasticity index in relation with liquid limit and sieve analysis will provide us valuable information for soil classification. In case of pavement design, group index (GI) is very important term that are found based on above three information. A higher value of the group index means that the poorer the soil as subgrade material. a = percentage of soil particles passing through No.200 or 0.074 mm sieve more than 35% but not more than 75%. i.e. 35 %< a < 75%. Besides this other soil classification system like AASHTO soil classification system, unified soil classification system uses plasticity index and liquid limit and grain size analysis to classify fine grained soils. • For a same plasticity index, when liquid limit increases permeability and compressibility are found to be increased whereas toughness and dry strength is decreased. • For a same liquid limit of two samples, when plasticity index is increased, permeability decreases whereas toughness and dry strength are increased. But compressibility is found almost unchanged. • Soils having high plasticity index are considered clay and those having lower value are considered silt. In case of zero value, soil are considered to have little/no clay or silt and called non-plastic soil. • A lower plasticity index of two soil is indicative to have high organic matter in soil. We have all know more or less about plasticity chart this is nothing but a plot with plasticity index against liquid limit. Plasticity chart is extensively used in classifying fine grained soil. Soil that possess high plasticity index, often show a marked reduction in bearing capacity with increase in moisture content. When moisture have access into the road surface and reached to this type of soil, undulations are developed on the road surface under the passage of vehicular traffic. It may be required total reconstruction of the road, When too much rutting is appeared, , which is very expensive. This may leads to intermixing or blending with lower layers of pavement. This effect becomes maximized when subgrade layer is mixed with underneath unbound granular layer which yields poor drainage followed by stiffness degradation and finally reduce stability. PI zero means non-plastic i.e. tend to have little or no silt. So the soil is clay if PI is zero. PI of zero would be non plastic, a low PI is silt, and a high PI is clay. A rock would have a PI of zero because it has zero moisture a d can't be rolled. after mixing the soils of high and low PL values, you start the procedure to determine new PL of the new mixture. the properties of the mixture will change. is it good to use soils with every high liquid limit.. ? Kayak plasticity index ki value negative ho sakti h.
Yeah, it's possible if plastic limit is more than liquid limit which is generally not the case. Plasticity index is negative possible or not.....??? i have question, i have taken the soil sample for testing atterberg limits and it happen that the liquid limit of the soil was achived, the problem happen in the other the soil sample when i rolled it it failled to be rolled extacly into 3mm in diammeter, so i decide to leave finding plastic limit because when when i tried rolled into small it failed, so the question is will be plastic limit be zero, ?? apart considering the little allowing rolling of the sample?